With summer at its end and fall around the corner, I am already getting calls for catering holiday parties and it hit me that we have less than one hundred days until Christmas! (It truly is mind boggling…where does the time go?) Do you know the best and worst part about the end of the year? The holidays, the food, and the waistline! (You know exactly what I am talking about.) All the get-togethers, casseroles, candies and calories leading to the same old New Year’s resolutions to drop the 15 pounds you picked up over the holiday season and start all over again in 2017. Bah Humbug! I say forget about it…life is too short and an indulgence now and then is what life is all about, right? So before we get to the holiday season and start having to make those life altering decisions to put down the fudge and divinity, or say no to eggnog and apple cider, I say I N D U L G E and feel zero shame with this heavenly Cinnamon & Cayenne Honey Crème Brûlée. It hits all the marks and is elegant yet simple to make. One of my favorite foodie quotes recently is “Seize the moment, remember all those women on the Titanic who waved off the dessert cart.” Erma Bombeck. I say, “Tomorrow isn’t guaranteed but today we have Crème Brûlée.” Enjoy! Preheat the oven to 325 F. Place the ramekins for the Crème Brûlée in a deep baking pan, making sure the ramekins do not touch each other. Using a garlic press, press the chopped ginger into a heavy-bottomed medium saucepan. Collect the ginger juice and the fibrous pieces into the saucepan, along with the pressed ginger. Add the heavy cream. Add the vanilla. Place over medium heat. Bring to a simmer. Reduce the heat and simmer for 15 minutes. Remove from the heat and let stand to infuse for an additional 15 minutes, stirring occasionally. Place the egg yolks into a medium bowl, add the honey and whisk to combine. Add the sugar and whisk vigorously for about 3 or 4 minutes until the sugar is melted and incorporated. The mixture should be thick and pale yellow, with ribbons of the mixture falling from the whisk when lifted. Add the cinnamon and cayenne pepper. Gradually whisk in the cream mixture, tempering the egg, honey and sugar mixture if the cream and ginger are still hot. Pour the mixture through a fine mesh sieve into a clean bowl, pressing on the ginger to release all the liquid. Discard the ginger solids. Rap the bowl with the cream and egg mixture on the counter to release any air that was incorporated into the mixture during whisking. Using a ladle, pour the mixture into the ramekins filling each about ¼” from the top. Skim off any foam that forms on the surface. Pour hot water into the baking pan so that it reaches about half-way up the side of the ramekins. Bake until the custards are firm, but the centers are still a bit loose, about 50 to 55 minutes. Remove from the baking pan and cool completely on a wire rack. Wrap in cling film and refrigerate until ready to serve. 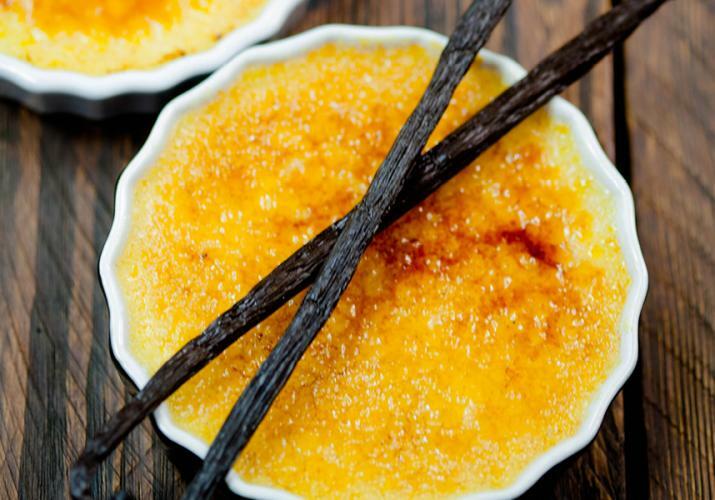 Sprinkle a light layer of brown sugar over the surface of each Crème Brûlée. Using a culinary torch, caramelize the sugar. As an alternative, place the ramekins on a baking sheet and place under a broiler. Watch carefully to avoid burning the sugar. Also note the oven should not be hot, only the broiler should be hot: otherwise you may end up with a liquid custard. The tops should caramelize in 1½ to 2 minutes. Serve immediately, or return to the refrigerator until ready to serve. Making CrèmeBrûlée ahead of time is great when you plan enough in advance. If you find yourself trying to prepare these the afternoon of your party, try this quick cool down trick: once you remove the Crème Brûlées from the oven, place them on a wire rack in a cool area of the house for about one-half hour. Loosely cover the ramekins with cling film and place in a roasting pan filled with ice. Place in the freezer for about 45 minutes. Remove from the freezer, pull the cling film tight and hold in the refrigerator until ready to serve. Your custard will be set and cool enough to take the heat of the broiler without melting the custard.